Anzani 3 cylinder engine – The Pioneer Aviator – Engines Parts ETC. During the early years of aviation, the most important thing was to find a suitable engine for your construction. The famous Italian motorcyclist Alessandro Anzani knew this problem, so he started his own engine factory to make aeroplanes engines. His first aeroplane engine was the 25 horsepower 3 cylinder W type, with 57 degrees between its cylinders. This engine powered the Bleriot XI monoplane. As Bleriot started to make this plane in series Anzani had to make his engine in series as well. Later he designed more than 30 types of engines for a variety of aeroplanes. To make a totally authentic Bleriot XI you need a working Anzani engine. This was the main point when we started our company. As these engines are very hard to find especially in working condition we decided to make working replicas ourselves. After finding an original example we redesigned the engine with modern 3D technology. 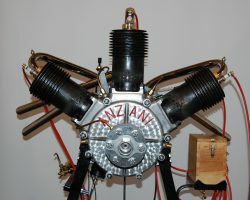 After 2 years of hard work the first replica Anzani engine did its first successful run in 2011. Our engines are totally authentic and original except for the oil system which is improved, for safe running. If you need an engine for your project we can make an Anzani engine for you, just send us an inquiry.